The following video is a compilation of The Latin Rhythms Show the Madison County Spanish 3 and Spanish 4 classes attended in the Fall Semester of 2016. Students enjoyed listening to music and seeing dances, both traditional and contemporary, from all over the Spanish speaking countries of the world. Students were mostly impressed with the costumes and their vivid colors. They talked about how exciting the show was as they had never seen anything like it. It was truly an enriching experience for our students who had never seen culture through this art form. Jamar said he liked the Tango because of the straight forwards and backwards movements. Jerica commented how much she liked the clothing because it was so colorful. Gaines said it was a lot of fun to watch how fast some of the dances were and he had never seen a show like that before. 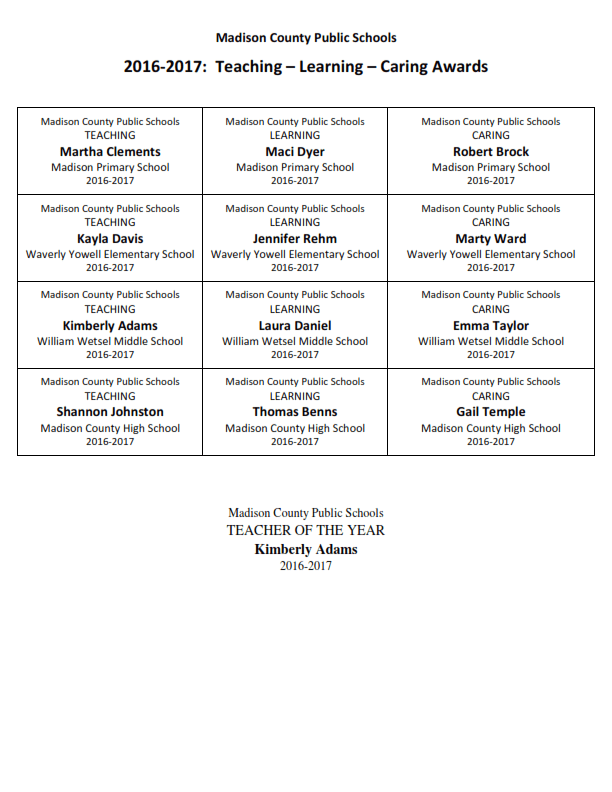 We have great teachers in Madison, and we are very pleased to share their names and schools with you. They represent the level of teaching, learning, and caring for our students that make us very proud! Watching them walk up to the stage of the Madison High School auditorium to be recognized at the School Board Meeting on May 15, we were reminded of the impact one teacher can have on the life of a student. These women and men make a difference for our students. THANK YOU! This year the Madison County Education Foundation awarded scholarships totaling $9500 to students who will pursue their dreams. They will continue to learn. Then they will teach, farm, compute, build, write, experiment, discover, and change their part of the world. Award winners were Sarah Catherine Coates, David Lewis Dyer, Jr., Grace Katherine Fox, Mikayla Nicole Gardiner-Alger, Sarah Elizabeth Good, Jared Christian Ross, Isiah Diamonté Smith, De’Ondre Rashaud Twyman, and Jiani Zang. Awards were presented by MCEF Board members Rachel Graves, Jayne Penn-Hollar, and Barbara Kres Beach. Community commitment to the education of our students is nowhere more evident than at Awards Night in the Madison High School Auditorium, which celebrates the achievements of graduating seniors. At Awards Night, 42 community organizations and individuals came together to assist our students and their families ease the burden of the Big Move from high school to two-and-four year colleges and universities, trades education, career and technology institutions, and the military. Congratulations to all the graduates of the Class of 2017. You define Madison Pride and you make all of us very proud.